If you have a dog lover on your Christmas gift list, then what could be better than a “feel good” story about a dog… and one who is still alive today. All profits from sales will be directed to the Oakville & Milton Humane Society (OMHS). The following is copied from the Introduction to “Who Said I was up for Adoption?” (A story about one calculating dog… and one unsuspecting human.) 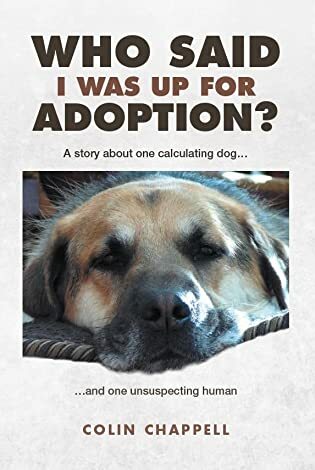 “Who Said I was up for Adoption?” is available direct from Friesen Press, and also from amazon, good reads and other on-line book retailers. Ray was picked up by the OMHS on November 20, 2012 after being reported running on a farm with a similar dog in the Ninth Line and Upper Middle Road area of Oakville. Neither dog had any identification; however, based on the condition of his teeth, Ray was estimated at two years old. On the assumption that they could well be siblings, they were both placed in the same secured area until such time as they could be assessed and due process started in order to prepare them for adoption. Unfortunately, a fight started and OMHS staff had to rush in and separate them. Upon reviewing the situation, it was determined that Ray was not the aggressor but merely defending himself the only way he could in an enclosed area. He was soon considered a strong possibility that, with training and regular human contact, he could be a candidate for adoption. The other dog, however, was apparently rather more of a challenge. In February 2013, after almost four months of training and caring attention, Ray was moved into the adoption area. Who would have possibly predicted that our respective paths would cross? Who would have possibly known that I would fall in love with a seventy-five pound dog that was reactive, anti-social, undomesticated, one that showed no indicators of any prior training, but displayed significant indifference and “attitude”? Who would have guessed that this unlikely match would result in a book in which both of us could tell our stories! A book does make it perfect for gifting 🙂 I will be sharing this with some friends in Toronto! Ahh! Yes, that would add the perfect touch! Who would have thought… life is amazing!! This is an excellent choice for a Christmas gift!